Freebie Alert! 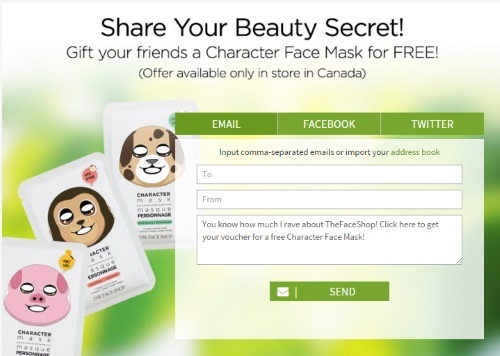 The Face Shop is offering a Free Character Face Mask! These are available in-store only in Canada. You can send up to 3 sample vouchers to your friends and claim 1. There are 500 samples available, 1 per household, while supplies last. Click on the link in the email that you get (when someone has sent you one) and fill out the form, your confirmation will be sent and your voucher within 48 hours.